South India Temple Tour is one of the most sought-after tour packages among the south India tours. As is quite evident from the name of the tour package, the unique thing about South India Temple tour is that it makes you visit all the important South India Temples. This South India Tour is not only a pilgrimage tour but also gives you an insight into the engineering and architectural excellence achieved centuries ago by the then dynasties also. South India Temples tour starts from Chennai, the capital of Tamil Nadu state of India and on the very first day of the tour, takes the travelers to Trichy, a city famous for it is Hindu Temples. From Trichy, this South India holiday tour proceeds to Rameshwaram, pilgrimage city famous for being the seat of Jyotirlinga of Lord Shiva. Beyond this South India Temple Tour takes travelers to Kanyakumari, which is located at the southernmost tip of Indian peninsula. The next destination of South India Temple Tour is Madurai, a marvelous temple city famous for its Meenakshi Amman temple. The last leg of South India Temple tour passes through Tiruvannamalai, from where travelers reach back Chennai. To help you plan your South India Temple tour well, we have provided some destination wise travel tips which would be very useful for you when you plan your South India Temple Tour. Upon arrival, you will be met and assisted by our local representative at the Chennai Airport who would assist you in your transfer to Trichy, also known as Tiruchirappalli. Upon arrival at Trichy, check-in at the pre-booked hotel in Trichy.After relaxing a while in the afternoon proceed to visit Rock Fort Temple. Among the many spectacular sites to visit in Trichy, the Rock Fort Temple is a must visit. The fort is a massive rocky structure constructed over a 273 feet high rock and houses two famous temples - Uchchi Pillaiyar Koil and The Siva Temple. Located on the banks of the river Cauvery, it is Trichy's most famous landmark. After this, visit Thiruvanaikaval Temple, which is a famous temple of Lord Shiva and one amongst the Panchabhoota Sthalams. Located at a distance of 7 kilometres from Trichy, Thiruvanaikaval Temple is an important spot to visit, especially for its religious importance. The city is famous for its Jambukeswarar temple. According to a legend, an elephant had once worshipped the linga (phallus) under the holy Jambu tree at this very site due to which it got its present name-Jambukeswarar. After the day tour we will return back to hotel. Overnight stay shall be at hotel in Trichy. Pancha Bhoota Stalam refers to the five Shiva temples, each representing the manifestation of the five prime elements of nature - space, air, fire, water, earth. 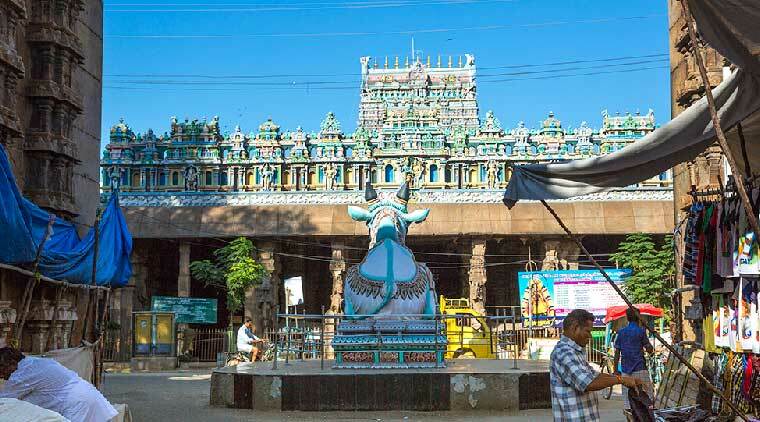 Sri Ranganathaswamy Temple – Located in the sacred town of Srirangam in Trichy, Sri Ranganathaswamy Temple is a must-visit place on your South India temple tour. The Hindu shrine is dedicated to Lord Ranganatha, a form of Lord Vishnu. Built between 6th and 9th centuries in Dravidian architectural style, the temple complex is spread across 156 acres and has 72 tiers. Rockfort Temple – The Rockfort Temple encompasses an ancient fort and a temple, perched high at 83 metres atop a rock which is believed to be the oldest in the world, dating back to 3800 million years. Jambukeshwara Temple – It is one of the most famous temples of Tamil Nadu, dedicated to Hindu God Lord Shiva. The beautiful temple, built by the Cholas in the 2nd century A.D., exhibits Dravidian architectural style and is a fine example of amazing stone carvings that depict various mythological tales. Tiruvanaikkaval Temple – One of the most famous temples of South India, it was built by Kochenga Chola clan which existed around 1800 years ago. 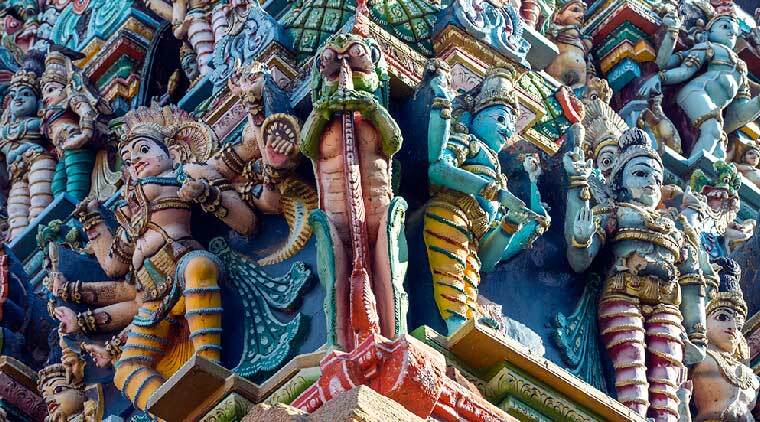 Being one of the five major Shiva shrines in Tamil Nadu, this South India temple must be on your list. Vayalur Murugan Temple – It is one of the most popular South India temples, located 9 km. west of Trichy in Tamil Nadu. The presiding deity of the temple is Lord Muruga, a form of Lord Shiva. Built by the Cholas around 1200 years back, this temple is a must-visit on your South India tours. Kannapa Chettinadu – A high-class non-vegetarian restaurant in Trichy, Kannapa Chettinadu serves authentic Chettinad delicacies with a traditional taste. Plush leather seating, dark wooden furniture and elegant interiors make the restaurant worth visiting on your South India temple tour. Price: Average Rs 350 per person. Banana Leaf – It is one of the most popular places to eat in Trichy, offering an impressive menu that includes regional fare from Kashmir to Kanyakumari. Price: Average Rs 70 per person. DiMoRa – The only casual fine dining restaurant in Trichy brings a delectable variety of North Indian and South India cuisine, served amidst a laid-back, cosy ambience that you will simply love. Price: Average Rs 120 per person. Golden Palm Roof Top Restaurant – It is Hotel Gardenia’s roof-top culinary delight that lays out a variety of dishes, ranging from Continental to Barbeque, North Indian and South Indian. Price: Average Rs 400 per person. Today we will proceed to another very important temple city - Rameshwaram. Upon arrival at the hotel in Rameshwaram after check in we visit the Ramanatha Swamy Temple, Rama Padam Temple, Pamban rail bridge. Visit all the Temples. Ramanathaswamy Temple – It is one of the most famous temples of South India and is one of the twelve Jyotirlinga dedicated to Lord Shiva. Built in the 17th century, it is a sheer architectural marvel. It houses the longest temple corridor in the world, 197 metres long and 133 metres broad and stands gloriously with 1200 breathtaking granite columns. An important pilgrim centre in India, it is a must-visit place on your South India holidays. Five Faced Hanuman Temple – The popular South India temple is highly revered by Hindu devotees and is situated 2 km. from the Ramanathaswamy Temple. Folklores have that Hanumana, a mythological character from Hindu epic Ramayana, exhibited his 5-faced form for the first time in this place. Kothandaramaswamy Temple – The 500-year old temple is a prominent pilgrimage centre in Rameshwaram, situated very close to the sea. The temple houses idols of Lord Rama, Devi Sita, Laxman and Vibhishan, the brother of Ravana from Hindu epic Ramayana. The temple walls feature artistic paintings depicting the story of Rama performing the last rites of Vibhishan here. Ahaan – A plush vegetarian restaurant at Daiwik Hotel in Rameshwaram, Ahaan offers brilliant multi-cuisine menu with Indian and international flavours. Ashok Bhavan – It is a popular choice for South Indian delicacies at an affordable price. Delicious vegetarian thalis are available at just INR 35. Ram Nivas – For real taste of North India, head off to Ram Nivas, known for its delicious vegetarian North Indian dishes. Price – Average INR 15-40 per person. After breakfast , we will proceed to Kanyakumari. It is the southernmost tip of the Indian Peninsula and the meeting point of three seas, namely Arabian Sea, Bay of Bengal and the Indian Ocean. At Kanyakumari ,if the time permits you can enjoy the sunset in the evening and visit the Vivekananda Rock Memorial and the Kanyakumari Devi Temple. Enjoy the sunset. Kanyakumari Bhagavathi Amman Temple – It is one of the most famous Hindu temples in South India, dedicated to virgin Goddess Kanyakumari or Bhagavathi Amman, an incarnation of Goddess Parvati. It is among the 108 Shakti Peethas in the world and holds immense significance to Hindu devotees. You must visit this renowned temple on your South India temple tour. Sthanumalaya Perumal Temple – The temple is situated at Suchindram in Kanyakumari district of Tamil Nadu. It is dedicated to Trimurtis or Three Gods – Brahma, Vishnu and Shiva. The shrine exhibits a Linga and it is believed that the top, middle and base of it represents Shiva, Vishnu and Brahma respectively. Thiruvattar Sree Adikesava Perumal Temple – Your South India tour packages should include this ancient time, built way before the Padmanabha Swamy Temple at Thiruvananthapuram. It is nestled amidst three rivers – Kothai, Parali and Thamirabarani – on three sides and houses the idol of Adikesava and Sree Padmanabha. Nagercoil Nagaraja Temple – A popular pilgrim destination near Kanyakumari, the temple houses the five-headed idol of Nagaraja, or the Lord of Serpents. Hotel Seaview – Their in-house restaurant serves delicious vegetarian and non-vegetarian dishes, perfect to savour against breathtaking views of the sea. Price: Average INR 350 per person. Hotel Seashore – Dine amidst a relaxed ambience as you sip on your favourite wine or spirit at Flames or take a quick bite at Cafeteria Lounge. Price: Average INR 410 per person. Sangam Restaurant – The restaurant offers a variety of lip-smacking fare, including South Indian, authentic Kerala foods and multi-cuisine delicacies. Price: Average INR 280 per person. After breakfast, we will today proceed to Madurai, another beautiful and historical place in south India. Upon arrival check in at hotel. After relaxing a while, proceed for sightseeing tour of Madurai visiting SRI MEENAKSHI TEMPLE , temple dedicated to the consort of Lord Shiva. The five Gopurams that surround the temple are well known for stuccowork, and the 48.8 metre high southern gopurams is the tallest. 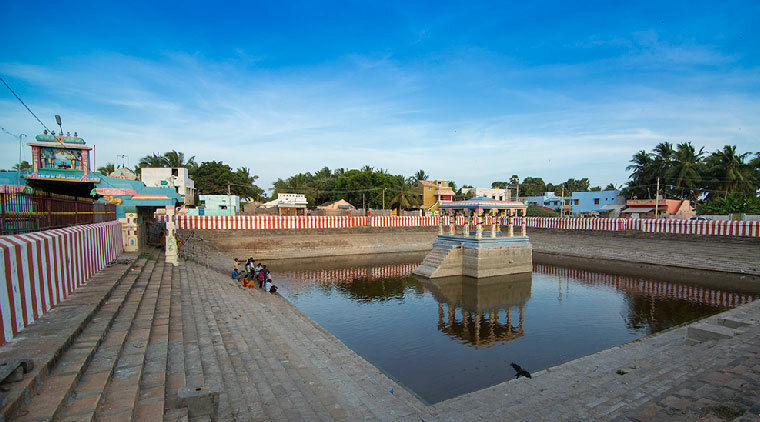 Legend has it that when the last Tamil Sangam met here, literary works were thrown into the temple tank. Those that floated were deemed to be outstanding literature. The HALL OF THOUSAND PILLARS is a museum of icons, photographs and illustrations. THIRUMALAI NAYAKAR MAHAL, 1 km from the temple is known for the musical pillars and the pathway. GANDHI MUSEUM is dedicated to Mahatma Gandhis life and work and is housed in the 300-year-old Mangammal Palace. It has a collection of Mahatma Gandhi's personal memorabilia, books and letters, a fine exhibition of South Indian village industries, handicrafts and a huge open-air theatre. Over night stay at hotel in Madurai. 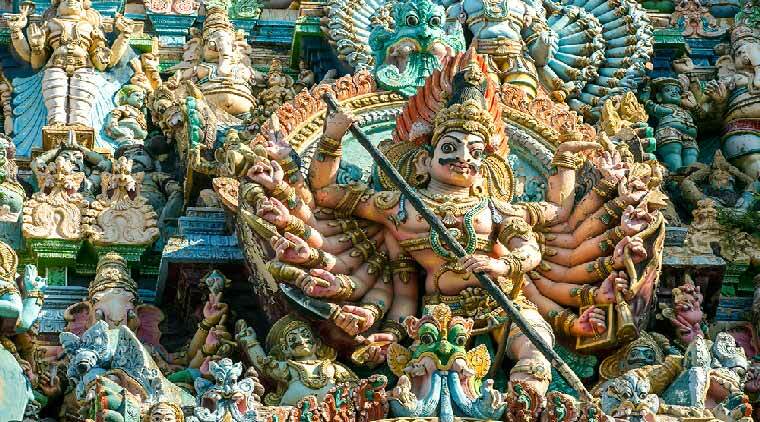 Meenakshi Temple – The world-renowned Meenakshi Amman Temple is a must-visit on your South India temple tour that unveils Tamil Nadu’s rich culture and spirituality. 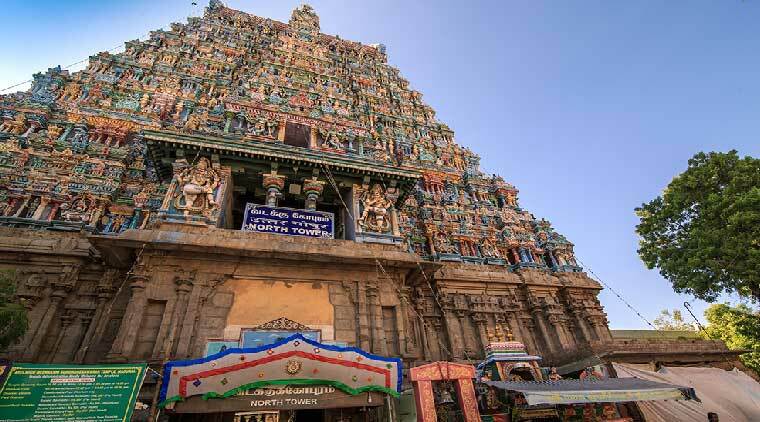 It is dedicated to Goddess Meenakshi, or Goddess Parvati and her consort, Lord Shiva, here known as Sundareswarar. 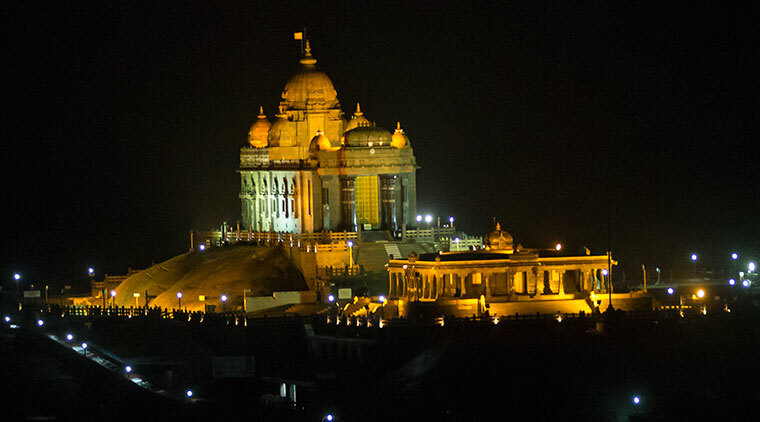 An architectural splendour, you should not miss visiting this famous South India temple. Thirupparamkunram Murugan Temple – It is one of the Arupadaiveedu – the six abodes of Lord Muruga. The massive temple is carved in rock and offers stunning beauty. Azhakar Kovil – The famous South Indian temple is dedicated to Lord Vishnu. It features similar architectural style as that of other South India temples, including pillared mandapams and large gopurams. Sri Subramania Swamy Temple – It is perched on a hill top and offers picturesque view of the Jawadu Hills, Padavedu Village and the nearby Renugambal Temple. It houses the idol of Lord Subramania with his consorts Goddesses Deivanai and Vallai standing on a peacock. Kadambavanam Restaurant – Relish authentic Tamilian cuisine made from fresh meat, vegetables and herbs. You will also get several regional delicacies that you will find nowhere else. Price: Average INR 300 per person. Hotel Aarthi – A perfect place for tourists looking for mouth-watering culinary delights. Price: Average INR 150 per person. Taj Restaurant – High-quality non-vegetarian delicacies from around the world, served in a plush ambience with elegant interiors. Price: Average INR 300 per person. After breakfast at hotel, proceed to Tiruvannamalai and check into Hotel. After refreshment proceed for sightseeing which includes Arunachaleswara Temple, Sathanur Dam , Gingee Fort, Padaveedu .Later reach back hotel . Annamalaiyar Temple – A famous Hindu temple dedicated to Lord Shiva, it is located at the foothills of Annamalai in Tamil Nadu. Here Shiva is worshipped as Annamalaiyar or Arunachaleswarar and his idol is referred as Agni Lingam. The temple complex is spread over 10 hectares and is one of the largest in India – a must-see on South India temple tour. The Dreaming Tree Restaurant – Here you will find everything organic! From its cosy interiors to grilled sandwiches, green salads, blended drinks, hearty soups and homemade cakes and breads, everything is pure natural and simple. Tiru German Bakery – Another popular health and organic food restaurant, German Bakery serves traditional German bakery food in addition to other delicacies. Chola – The Akash Inn restaurant specialises in authentic Oriental delicacies served with soups that can be picked from a wide spread. After breakfast, Check out. It's time to bid farewell. On time transfer to Chennai Airport for your return flight. Admission to some South India temples may require a nominal fee. Make sure your tour operator books the tickets well in advance or you may have to wait long in the queue. Your South India temple tour package may cover admission fee to some temples. Wear decent clothes as it is an important part of South Indian culture. Photography is prohibited in many temples. Make sure you respect the rule. Do not touch the idol or the priests in the temple. According to Hindu culture, it is a custom or symbol of respect to use your right hand when you receive the ‘prasadam’ or a part of the offerings to deities. Remove your shoes before entering the temple premises. Do not carry food or eat inside the temple premises. Leather is strictly prohibited in some temples. Read the instructions carefully before you enter the temple and if required, keep your belongings in the respective area. It is better that you hire a local guide or have a tour operator representative who can help you know the history of the temple, mythological stories related to it, culture, etc. The Secret of Temple Architecture– Temples of South India typically exhibit similar architectural style that includes Gopuram and Kalasam. Elaborate Gopuram, or a rising tower, adorn the temple entrance. These are exquisitely decorated with artistic sculpture and carvings and beautifully painted to demonstrate various themes from the Hindu mythology, especially those associated with the presiding deity of the temple. Gopuram is a unique feature of Hindu architecture style that sets South India temples aside from others. The Gopuram of the Sri Ranganathaswamy Temple in Srirangam, Tamil Nadu, is the tallest one in South India, going up to 196 feet! Kalasam, on the other hand, is another unique feature of Hindu temples in South India. The Kalasam, in the form of inverted pot, lies on top of Gopurams and are made of an alloy of 5 metals including gold, silver, tin and copper. The alloy gives the Kalasam electro-magnetic reception. The Kalasam is then filled with grains like rice, millet, ragi, corn, sesame, maize and salt in large quantities. These objects act as lightning conductors and are used as ‘earthing’ to protect the temple complex from lightning. The grains are changed once in every 12 years during a festival called “Kudamuzhugu Vilzha” because the grains have a capacity of 12 years to absorb electro-magnetic waves. The architectural style of temples in South India clearly demonstrates utter scientific knowledge even during the ancient times. The Richest Temple in the World– Sree Padmanabhaswamy Temple in Thiruvananthapuram is one of the 108 Divya Desams or holy abodes of Lord Vishnu. It is believed that the idol of Lord Vishnu was found in this place. Considering utter divinity and spiritual significance of this place, Sree Padmanabhaswamy Temple is one of the most important pilgrim centres in India. But that is not all! It is also one of the richest Hindu temples in the world with treasures worth over Rs 1 lakh crore. Another South India temple, Tirupati Venkateshwara Temple in Tirumala, Andhra Pradesh, has over 50,000 crore rupees worth of treasures and is one of the richest temples in India. Interesting Facts About Meenakshi Amman Temple in Madurai – The Meenakshi Amman Temple, featuring 12 breathtaking gopurams embellished with colourful stucco figures, is among the most famous temples of South India. No wonder, why it should be on everyone’s list of places to visit during South India temple tour. It was one of the top 30 nominees for the “New Seven Wonders of the World.” There are an estimated 33,000 sculptures in the temple, depicting the brilliance of Vijayanagar temple architecture. It attracts over 15,000 visitors per day and around 25,000 on Fridays. The 10-day Meenakshi Tirukalyanam Festival is celebrated annually during April and May and attracts over 1 million visitors. Per Person Rates with 3 star Hotels. •	Meal plans as mentioned above . •	Daily Breakfast at hotels. •	All transfers and sightseeing by A/c Indigo as per the itinerary. •	All toll, tax, parking, driver bata & fuel cost. •	All Taxes (3.09% GST). •	All meals not mentioned above. •	All other items other than mentioned in 'price includes'.